Giant NeosTrack Review - LA VELOCITA. First spotted at the Tour Down Under in 2017, we managed to get our hands on Giant’s NeosTrack GPS. It’s an interesting move for Giant, a company that makes almost every bike part and accessory short of drivetrain components. So what’s served up by the NeosTrack? Well it’s sometimes great, sometimes confusing, frequently quirky, but undoubtedly a unit that will appeal to many. Its $299 price makes it particularly compelling. It’s widely known that the chassis of the NeosTrack is a Bryton 530 with Giant’s software package and button mapping over the top. So the Bryton and Giant might look similar, but are very different units to use. The Giant NeosTrack is rocking a generous 2.6” anti-glare screen. It’s one for the monochrome fans with zero colours in sight. There’s a simple 5-Button layout with the on/off button living on the bottom, up and down/menu on the right side of the unit, and a start/forward and stop/back button on the left. The status icons showing battery life and connected sensors occupy a tiny band across the top of the screen, leaving plenty of real estate for the data screens below. It’s a well-proportioned unit. Its height and width are balanced, bezels don’t dominate the face, and it’s surprisingly thin and light. The underside of the unit houses a micro-USB port with a thick rubber seal over the top. There’s a 1/8th turn mounting system that looks and feels like Garmin’s quarter turn system, just bigger in diameter and with larger tabs. That means no compatibility with Garmin or Wahoo mounts unfortunately. Now this is where the quirks of the NeosTrack start to emerge. The menu structure is easy enough to navigate after a bit of clicking around, and doesn’t have the really deep rabbit holes you find on a Garmin. Most things are accessible within 2 or 3 menu levels of the top. 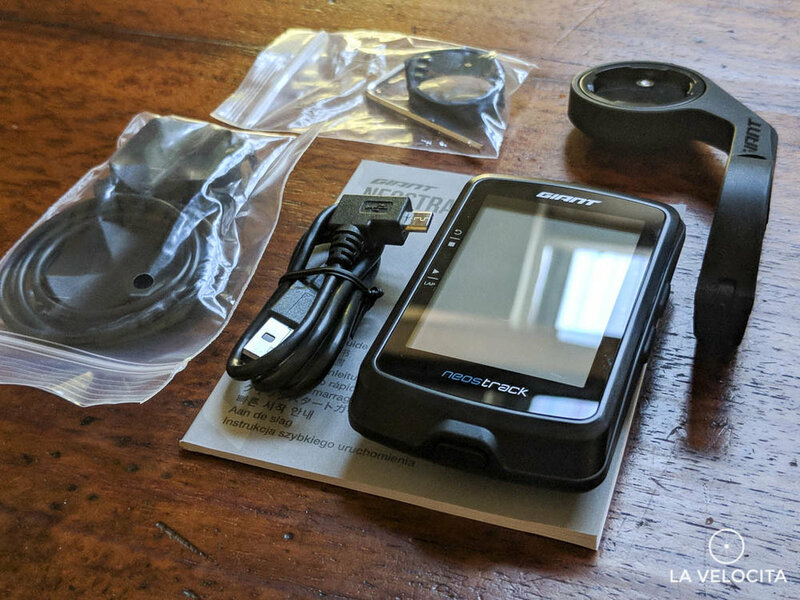 Setting everything up is a patience tester - but to be fair, so is every Garmin I've used. First you'll fire up the unit and create a profile for your bike. Next you fire up all your sensors. It connected to all of my Ant+ sensors, and Stages power meter with no problems. Keep in mind, all sensors must be paired before you start an activity. It gets very clunky when setting up your data fields. You need to choose the number of fields first, but changing the number of fields resets the ones you’ve already defined. So adding a 4th field to a screen resets the other 3 after you’ve chosen them. You can have up to 6 pages or data screens with between 3 and 10 fields each. Pages can be turned on and off but you need to know your data pages intimately well to avoid clearing the whole page when you’re turning it back on. The NeosTrack will remember what fields you’d set, but you have to choose the exact number of fields when turning the page back on. Choosing 5 fields when reactivating a page that only had 4 will wipe the fields clean and you’ll have to set it from scratch. There’s a whole lotta options of data screens, I won’t list them all for obvious reasons, but suffice to say I didn’t lack the one I wanted. There’s also a screen for the route if you're following one, and an altitude. Both of which can be switched off. There’s two options for creating routes for the NeosTrack; either drag and drop a .gpx into the AddFiles folder when it’s connected to a computer, or tap away on the aforementioned Giant Neos app and direct upload it to the unit. I like manually adding gpx files because it lets me create courses in my preferred programs; Strava or RideWithGPS. Once that gpx course is on the device you get a breadcrumb trail to follow. It’s a simple but effective black line to follow. It’ll give you off-course warnings but won’t run through Garmin’s protocols of directing you back. Turn guidance is not an option with gpx courses. You can create routes with the NeosTrack app or website. But it’s basic. Really basic. You select a start and end point by either dropping a pin or typing an address and then the NeosTrack links them. You can’t choose what happens between the points, or keep adding points to lengthen the route. I found the system would try and send me up fire tracks, walking tracks, major highways, or anything that could be a road. Suffice to say, I didn’t bother using this to make routes. It’s just not smart enough yet. I sincerely hope they do work on this feature because better route creation is a critical feature nowadays. The NeosTrack is a nice unit to ride with. There are numerous annoyances setting up the device but that's all left behind when you're on the bike. The sizeable screen is very easy to read. I loaded up some screens with fields and didn't have any problems reading them. The anti-glare treatment works pretty well but isn't 100% effective. It's certainly better than the mirror-esque screen on my old Edge 800 that frequently blinded me. The NeosTrack is an unobtrusive unit that quietly peeps when stopping, starting, connecting to GPS etc. Garmins always seem to be fighting for your attention, shrieking to notify you of every thought that crosses its mind and changing screens to show you something. There’s just so many things you have to switch off with a Garmin to quiet it down. The NeosTrack isn’t like that. It just quietly goes about its business so you can go about yours. Buttons are easily accessible and require a decent press to operate. All I really did on the bike was switch between screens, or occasionally hit the lap button. Data accuracy is on-par with my Garmin when I did a side-by-side test. There were some incremental variations between altitude gained and average speed across a ride as expected. My biggest gripe is the inability to change anything other than device tones and backlight once an activity has started. All data pages and fields are locked, no sensors can be connected, and you cannot begin a route. You have to stop your activity to change anything. That is annoying. Word from Giant (via the CyclingTips review) is they're looking to fix this but it's still an issue at time of review. 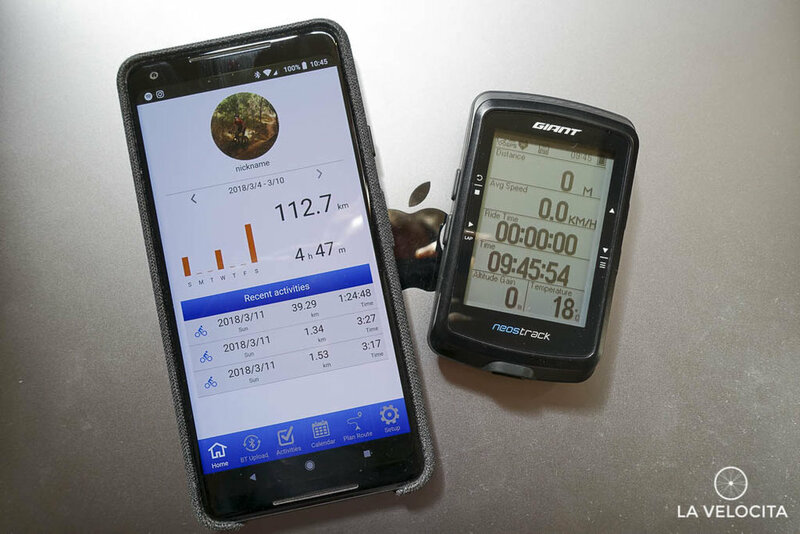 When you’re done riding, there’s 3 ways to upload your activity; direct file upload from your computer, Bluetooth, and WiFi. Bluetooth uploading is comically slow. Open the app, hit “BT Upload” and then watch a status bar fill at a glacial pace. A short 20 km MTB ride took around 10 minutes to upload via Bluetooth. Both Garmin and Wahoo devices I’ve used will upload in seconds so the NeosTrack is well behind on that. Once it’s done, the app will share the file over to you’re connected services. With the slow Bluetooth, WiFi uploading became my default. You connect the unit to your home WiFi then select “WiFi Upload” from the top level menu. The unit runs through a zippy process of checking maps, checking Firmware, syncing routes, and uploading all activities. It’s all done quickly and is minutes faster than Bluetooth uploading. The NeosTrack’s battery life is one of the hottest selling points for the unit. It’s fantastically long. Unfortunately it’s very hard to do side-by-side battery tests against other units because the Neos Track does not give battery level as a percentage, just a tiny battery icon in the status bar at the top of the screen. The tiny icon means I can’t accurately say whether the unit has 30% or 40%. It’s just too small. Nonetheless I can assure you the battery lasts substantially longer than any other unit. Giant claim 33 hours maximum run time. For me, that meant charging once a fortnight rather than every couple of days. No more USB battery packs to keep my bike computer running through a long ride. I expect it’d run through a 24 hour ride, even with the backlight run through the night. There’s some interesting training and testing workouts you can pre-plan. The unit was initially given to their sponsored Giant Alpecin, now Sunweb, team for their riding so with the unit to determine max heartrate, functional threshold power, lactate threshold, and maximum aerobic power. it. It’s a nice addition for people who like to follow structured training programs. I can see a broad market for the NeosTrack. It'll appeal to the price conscious buyers who value simple operation, a good hardware package, nice screen, and mega battery life. The power nerds are well catered for too witch plenty of functionality built in for the racing cyclists through the Giant Lab. It’s easy to chastise the NeosTrack for its frustrations but this is a first generation unit with a very good hardware base. So long as Giant keeps developing the software, which they are planning to, many kinks will eventually get ironed out. I'd like to see better route creation, better management of data fields and pages, and the ability to change settings once an activity has started. Those tweaks will make a substantial difference to the user experience. Developing the Neos Track app to completely manage device setup like Wahoo have created would be a brilliant feature. Giant, please make that happen. Frustrations aside, I like the NeosTrack. It gets easier to live with once you know its quirks. It's a genuine challenger to Garmin's market dominance. Its RRP of $299 AUD for the head unit make this an easy unit to recommend. That's a full 100 clams cheaper than a Garmin Edge 520. The NeosTrack gets a lot right and I look forward to seeing how Giant develops the unit. Disclosure statement: This unit was supplied by Giant for review. Head over to the Giant website for more information about the NeosTrack.